Kibow Biotech, Inc. is pleased to provide you with this website and its content for general informational purposes. Please carefully read these Terms and Conditions relating to the use of our website. These Terms and Conditions govern your use of this website and any purchase of products or services which may be offered from time to time by us. By using our website, you agree to these Terms and Conditions without limitation or qualification. If you do not agree to these Terms and Conditions, please do not use our website. We reserve the right to revise these Terms and Conditions or any portion of them at any time without notice by updating this posting. In addition, we may make changes in information about price and availability without notice. You are bound by any revisions and should periodically visit this page to review the current Terms and Conditions that apply to your use of our website. When using particular services or features or making purchases on this website, you are subject to any posted guidelines or policies applicable to such services, features or purchases that may be posted from time to time. All such guidelines or policies are incorporated by reference into these Terms and Conditions. All content on this website is subject to change at any time without notice. Certain weights, measures and similar descriptions are approximate and are provided for convenience purposes only. The inclusion of any products or services on this website at a particular time does not imply or warrant that these products or services will be available at any time. The products, information, services and other content provided on and through this website, including information that may be provided on this website by a healthcare or nutrition professional employed or contracting with us, is provided for informational purposes only and is not meant to substitute for the advice provided by your doctor or other healthcare professional. Do not use the information available on or through this website for diagnosing or treating a health problem or disease, or prescribing any medication. Persons requiring diagnosis or treatment, or who have specific questions related to their condition or care, are urged to contact their health care, provider. With respect to nutritional supplements and therapies, you should always discuss with your health care provider to verify conditions of use and identify any contraindications. The information contained in this website does not constitute medical advice and users are urged to consult their doctor with any drug or health related questions they may have and before using any medication or nutritional product, before starting any diet or exercise program or before adopting any treatment for a health problem. Each person is different, and the way you react to a particular product may be significantly different from the way other people react to such product. You should also consult your healthcare provider regarding any interactions between any medication you are currently taking and nutritional supplements. Information and statements regarding us and/or Renadyl™ and/or any other products have not been evaluated by the Food and Drug Administration and are not intended to diagnose, treat, cure or prevent any disease. Read carefully all product packaging prior to use. In an effort to assist users in identifying medical resources, we may contract with certain health care institutions that consider themselves to have expertise in the research, diagnosis, and treatment of particular diseases or health conditions. These third parties may be mentioned on this website and this website may provide a link to those third party websites. We make no warranties or representations, and expressly disclaim any responsibility for, the information or treatment that you may receive from any listed health care provider. We will use your e-mail address solely to provide timely information about Kibow Biotech Inc.
Kibow Biotech Inc. will maintain the information you send via e-mail in accordance with applicable law. If you make a purchase on the website, your purchase will be subject to these Terms and Conditions, including the terms of our Purchase Policy (which is hereby incorporated into and made part of these Terms and Conditions), which are incorporated by reference into any applicable purchase order or written agreement between the parties. Please review our Purchase Policy before making any such purchase. By submitting payment information in connection with any such purchase and by otherwise ordering a product from us, you agree to be bound by the terms of our Purchase Policy. When an order is placed, it will be shipped to an address designated by the purchaser as long as that shipping address is compliant with the shipping restrictions contained on this website. The risk of loss and title for items purchased from this website pass to you upon delivery of the items to the carrier. You are responsible for filing any claims with carriers for damaged and/or lost shipments. Next Day Air Cold Ship – Your package will be shipped via air, delivery by end of next business day. The package will be shipped with ice packs, designed to keep the package cool during transit. Second Day Air Cold Ship – Your package will be shipped via air. Allow 2 business days for arrival. The package will be shipped with ice packs, designed to keep the package cool during transit. 3 Day Select – Your package will arrive at your location in three business days. Next Day Air (Non-Cold Ship) – Your package will be shipped via air. Allow 1 business day for arrival. Package not shipped with ice packs. Second Day Air (Non-Cold Ship) – Your package will be shipped via air. Allow 2 business days for arrival. Package not shipped with ice packs. Ground – Your package will be shipped using conventional ground shipping methods. Please allow 2-5 business days for arrival. Package shipped without ice packs. If you’re not satisfied with your first order, call 1-888.271.2560 end of 90 days and send the empty bottles back for a full refund, less shipping. 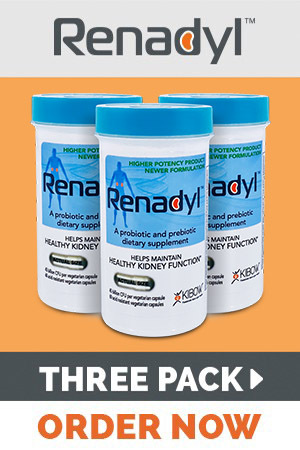 Good on Renadyl 3 pack, Synbiotic pack orders, first order only. Limit one per customer. Products are to be returned only after 90 days from the date of purchase. We suggest customers complete the 90 days course to get the benefits of the product as claimed. If, after ninety days of taking Renadyl, there is any reason you wish to return or claim a refund you can complete the Refund Claim form and fill the details and include it in the return package. 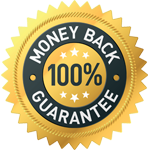 Kibow Biotech will give you a refund (less return shipping), that’s how confident Kibow Biotech is that you’ll love the product and improve the quality of life. Refund is applicable on Renadyl 3 pack, Synbiotic pack (Renadyl 3pack + Fortis) orders only. Please call Customer Service at 1-888.271.2560 to obtain a Return Authorization Number (RMA#). All requests for refunds and returns must be made within 90 days to 100 days of receipt of your package. Your package must be postmarked within 48-72 hours after the RMA # has been issued to you. Please note: Any packages that are returned to our office without an RMA#, including any orders which were not cancelled prior to order processing, and/or refused at the time of delivery, will have a return shipping fee of $15 (subject to change) deducted before a credit (if any) is issued. To ensure proper credit to your account, Kibow Biotech recommends that you use UPS, Federal Express or Insured Parcel Post for shipment. Please save your shipping receipt and your tracking information until your return is processed. If you have any further questions, please feel free to call Customer Service at 1-888.271.2560. Credits are issued within 14 business days after your return is processed in the Kibow Biotech Office. Refunds issued by paper check can take up to 4 weeks to be processed. Shipping costs are not refundable unless it is a result of our error. Credits are issued back to the original method of payment for the returned product. Please note that Kibow Biotech is not responsible for any bank or credit card fees that you may incur. (2) ensure that you exit from your account at the end of each session. You agree to be responsible for all charges resulting from the use of your account on this website, including charges resulting from unauthorized use of your account prior to your taking steps to prevent such occurrence by changing your password and notifying us. We cannot and will not be liable for any loss or damage arising from your failure to comply with this section. You agree to use this website only for lawful purposes, and that you are responsible for your use of and communications on this website. These Terms and Conditions are effective unless and until terminated by either you or us. You may terminate these Terms and Conditions at any time, provided that you discontinue any further use of this website. We also may terminate or suspend these Terms and Conditions, at any time, without notice, and accordingly deny you access to this website, if in our sole discretion you fail to comply with any term or provision of these Terms and Conditions or your use is harmful to the interests of another user or us. As a user of this website, you are granted a limited, non-exclusive, non-transferable, revocable license to access and use this website in accordance with these Terms and Conditions. The entire contents of this website are subject to copyright protection. You may not copy the contents of this website other than for non-commercial individual reference with all copyright or other proprietary notices retained, and thereafter the contents may not be recopied, reproduced or otherwise redistributed. Except as expressly provided above, you may not otherwise copy, display, download, distribute, modify, reproduce, republish or retransmit any information, text or documents contained in this website or any portion thereof in any electronic medium or in hard copy, or create any derivative work based on such images, text or documents, without our express written consent. Nothing contained herein shall be construed as conferring by implication, estoppel or otherwise any license or right under any of our patents, copyrights or trademarks. We prohibit the use of any of our trademarks, or any related graphic, as a “hot link” to any website unless approved by us. All product names, whether or not appearing in large print or with the trademark symbol, are our trademarks unless otherwise noted. The use or misuse of these trademarks or any other materials, except as permitted herein, is expressly prohibited and may be in violation of copyright law, trademark law, the law of slander and libel, the law of privacy and publicity, and communications regulations and statutes. We have provided links to certain third party websites as a courtesy. By providing these links, we are not endorsing, adopting or agreeing with any of the content of the linked sites or the products or services of that third party. We do not review or control the content of third party sites and that content is not part of our website. We expressly disclaim any responsibility for the content of any third party sites linked to or from our website or the products or services of that third party. We do not make any representations regarding the content or accuracy of materials on third party websites or the products or services of third parties. We urge you to use discretion when you access any third party sites linked to or from our website. You agree to defend, indemnify, and hold us and our affiliates, officers, directors, member, employees and agents harmless from and against any claims, actions or demands, including without limitation reasonable legal and accounting fees, alleging or resulting from your use of this website or our products or your breach of these Terms and Conditions. We agree to provide notice to you promptly of any such claim, suit, or proceeding and agree to assist you, at your expense, in defending any such claim, suit or proceeding. This website and its contents are intended to comply with the laws and regulations of the US. Although the information on this website is accessible to users outside of the US., the information on this website is intended for use only by residents of the US. We make no claims that the information or materials provided through this website are appropriate or may be downloaded outside of the US. Other countries may have laws, regulatory requirements and medical practices that differ from those in the US. If you access this website from outside of the US., you do so at your own risk and you are responsible for compliance with the laws of your jurisdiction. We reserve the right to limit provision of our products or services to any person, geographic region or jurisdiction and/or to limit the quantities or any products or services we provide. Any offer for any product or service made on this website is void where prohibited. Our website is operated from our offices in the State of Pennsylvania, USA. These Terms and Conditions shall be governed by and construed in accordance with the laws of the State of Pennsylvania without regard to any conflict of law provisions thereof. Any action related to these Terms and Conditions shall be brought only in a state or federal court located in Delaware County, Pennsylvania and all parties waive any objection to the exclusive personal and subject matter jurisdiction and venue in such courts. TO THE EXTENT PERMITTED BY APPLICABLE LAW, YOU AND WE HEREBY WAIVE THE RIGHT TO A TRIAL BY JURY IN ANY PROCEEDING OR LITIGATION BROUGHT AGAINST THE OTHER WITH RESPECT TO THESE TERMS AND CONDITIONS, THE PURCHASE OF ANY PRODUCT BY YOU, OR THIS WEBSITE. IN ADDITION, NEITHER YOU NOR WE SHALL BE ENTITLED TO JOIN OR CONSOLIDATE CLAIMS BY OR AGAINST OTHER WEBSITE USERS OR CUSTOMERS OF US, OR LITIGATE ANY CLAIM AS A REPRESENTATIVE OR CLASS ACTION OR IN A PRIVATE ATTORNEY GENERAL CAPACITY. If any provision of these Terms and Conditions is held invalid or unenforceable by any court of competent jurisdiction, such court is authorized and directed to rewrite said provision to the maximum extent enforceable and the other provisions of these Terms and Conditions shall remain in full force and effect. Any provision of these Terms and Conditions held invalid or unenforceable only in part or degree will remain in full force and effect to the extent not held invalid or unenforceable. You or we may suspend or terminate your account or your use of this website at any time, for any reason or for no reason. You are personally liable for any orders placed or charges incurred through your account prior to termination. We reserve the right to change, suspend or discontinue all or any aspect of this Web site at any time without notice. These Terms and Conditions of Use represent the entire agreement between you and us relating to the subject matter herein and shall not be modified except by us as provided herein or through a written document signed by both parties. The failure of either party at any time (or times) to require performance of any provision hereof shall in no manner affect the right at a later time to enforce such provision or any other provision. You agree that no joint venture, partnership, employment or agency relationship exists between you and us as a result of these Terms and Conditions or your use of this website. The section headings contained in these Terms and Conditions are inserted for convenience only and in no way define, limit or extend the scope or intent of any provision. All provisions which by their nature are intended to survive the expiration or termination of these Terms and Conditions shall survive and remain in full force and effect. Any cause of action by you with respect to us, our products or this website (and/or any information, products or services related thereto) must be instituted within one (1) year after the cause of action arose or be forever waived and barred. YOUR USE OF THIS WEBSITE IS AT YOUR RISK. THE INFORMATION, MATERIALS, AND SERVICES PROVIDED ON OR THROUGH THIS WEBSITE ARE PROVIDED “AS IS” WITHOUT ANY WARRANTIES OF ANY KIND INCLUDING WARRANTIES OF MERCHANTABILITY, FITNESS FOR A PARTICULAR PURPOSE, OR NON-INFRINGEMENT OF INTELLECTUAL PROPERTY. WE DO NOT WARRANT THE ACCURACY OR COMPLETENESS OF THE INFORMATION, MATERIALS OR SERVICES PROVIDED ON OR THROUGH THIS WEBSITE. TO THE BEST OF OUR ABILITY WE MAINTAIN THAT THE INFORMATION ON THIS WEBSITE IS COMPLETE, ACCURATE AND CURRENT. HOWEVER, DESPITE OUR EFFORTS, THE INFORMATION, MATERIALS AND SERVICES PROVIDED ON OR THROUGH THIS WEBSITE MAY BE INACCURATE, INCOMPLETE OR OUT OF DATE, OR MAY CONTAIN TYPOGRAPHICAL ERRORS. WE DO NOT MAKE ANY COMMITMENT OR ASSUME ANY DUTY TO UPDATE OR CORRECT SUCH INFORMATION, MATERIALS OR SERVICES. WE DO NOT WARRANT THAT THIS WEBSITE WILL OPERATE ERROR-FREE, THAT THIS WEBSITE AND ITS SERVER ARE FREE OF COMPUTER VIRUSES AND OTHER HARMFUL GOODS, OR THAT THIS WEBSITE DOES NOT CONTAIN BUGS, ERRORS, PROBLEMS OR OTHER LIMITATIONS. WE HAVE NO LIABILITY WHATSOEVER FOR YOUR USE OF ANY INFORMATION OBTAINED FROM THIS WEBSITE. ALL RESPONSIBILITY OR LIABILITY FOR ANY DAMAGES CAUSED BY VIRUSES CONTAINED WITHIN ANY ELECTRONIC FILE OBTAINED FROM THIS WEBSITE IS DISCLAIMED. IF YOUR USE OF THIS WEBSITE RESULTS IN THE NEED FOR SERVICING OR REPLACING EQUIPMENT OR DATA, WE ARE NOT RESPONSIBLE FOR THOSE COSTS. IN PARTICULAR, BUT NOT AS A LIMITATION THEREOF, WE ARE NOT LIABLE FOR ANY INDIRECT, SPECIAL, INCIDENTAL OR CONSEQUENTIAL DAMAGES OF ANY KIND (INCLUDING DAMAGES FOR LOSSES OF BUSINESS, LOSS OF PROFITS, LITIGATION, OR THE LIKE) THAT MAY RESULT FROM USE OF OR INABILITY TO USE OUR WEBSITE OR FROM YOUR USE OF ANY OF OUR PRODUCTS, WHETHER BASED ON BREACH OF CONTRACT, BREACH OF WARRANTY, TORT (INCLUDING NEGLIGENCE), PRODUCT LIABILITY OR OTHERWISE, EVEN IF ADVISED OF THE POSSIBILITY OF SUCH DAMAGES. THE NEGATION OF DAMAGES SET FORTH ABOVE IS A FUNDAMENTAL ELEMENT OF THE BASIS OF THE BARGAIN BETWEEN YOU AND US. THIS WEBSITE, THE PRODUCTS, AND THE INFORMATION WOULD NOT BE PROVIDED WITHOUT SUCH LIMITATIONS. NO ADVICE OR INFORMATION, WHETHER ORAL OR WRITTEN, OBTAINED BY YOU FROM THIS WEBSITE SHALL CREATE ANY WARRANTY, REPRESENTATION OR GUARANTEE. IN ANY EVENT, OUR MAXIMUM LIABILITY TO YOU UNDER ALL CIRCUMSTANCES SHALL BE EQUAL TO THE PURCHASE PRICE YOU PAY TO US, IF ANY, FOR ANY PRODUCTS, SERVICES OR INFORMATION.